Lex Witness, India’s 1st magazine on legal & corporate affairs, has been organizing a plethora of knowledge driven summits since its inception in 2009. These summits have been focusing on industry sectors right from Real Estate to Pharmaceuticals. 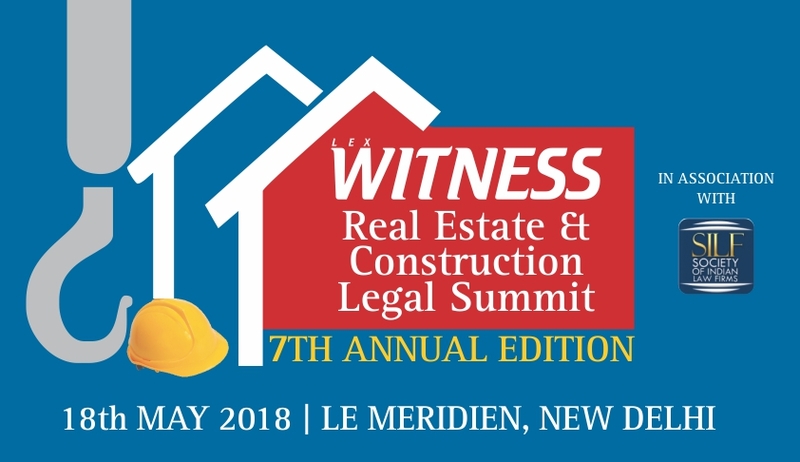 Lex Witness announces The 7th Annual Real Estate & Construction Legal Summit 2018. Venue: Le Meridien, New Delhi. Roaring RERA– Survival of the Fittest? Funding Fumes– Painting a Good Canvas Ahead? Regulatory Rhymes– New Wine in an Old Bottle? Inside the Courtrooms– Is There a Master of Art of Contracting? Tax Traumas– A Never Ending Storyline? It is in this context that the summit is scheduled to bring together various stakeholders of the governance and legal machinery of the country to see how best the existing challenges can be tackled with and foster the growth within the sector. In order to participate, in the form of speakers, delegates or sponsors, get in touch with Akshay Alagh (+91-9899332111, Akshay@WitnessLive.in). Special Offer for LiveLaw Readers: In order to register with a special 10% discount, use promocode ‘LIVELAW’ when registering here.